I got one by Ikea in Robinson Twp. Upon tuning left off of the driveway near the bus stop, you are greeted by this Good thing I saw this before I went over the handlebars and my wheel got bent. This horror – one of two in a half mile – is on Peoples Plank Rd, Ross Twp. Exactly where a bike would be. I got an actual phone call about this today, thanking me for my description of the situation and where it was located. They were to have a crew look at the two of them this afternoon. I’ll check this weekend when I can see in daylight whether they fixed them already or not. What agency’fixes these outside of the city? Depends. This one is PennDOT. Customer concern 20171205-D11-ATRPJP for Stuart Strickland has been closed. 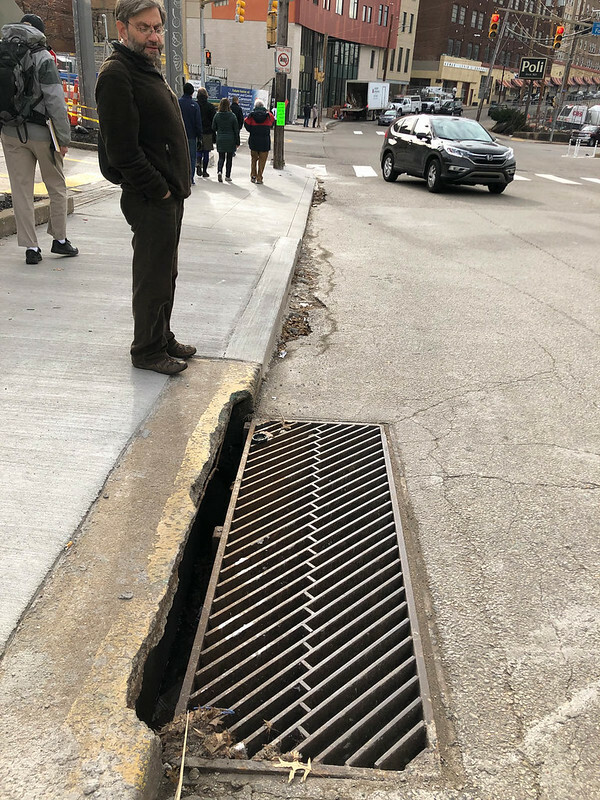 Closing Comments: These grates have been repaired. Thank you for the concern. Thanks and have a good weekend. I am surprised. If they can do that, why can’t sidewalks on bridges ever get swept to clear them of broken glass, garbage, and other debris that can puncture a bike or wheelchair tire? Why is this glass there to begin with? Why can’t that garbage stay in the car until someone can place it into a proper receptacle like a garbage can or recycling bin? Happy 10th anniversary to this thread! The first post was October 4, 2008. And today I found another one! On my coffeeneuring trip to North Park, there’s another one with the huge in-line slots on the shoulder of Pearce Mill Road, a couple hundred yards up from the corner with Babcock. Clearly marked as Allegheny County’s. Sorry, didn’t get a pic. Some time ago, I started to put together a spreadsheet of the 100 or so entries in this thread. Then I changed jobs and life got busy. I would love to hand this project off to younger hands, to map them all, track down the status of every one of these, and start getting in people’s faces to get these fixed. Maybe even line up funding from somewhere. I’m amazed we haven’t had any more wrecks. I know they happen, but we never hear about them. And we haven’t even identified all the grates yet! I also noticed a few broken grates in the gutter of the northbound shoulder of McKnight Rd. just north of Ross Twp. Junction. Also beware of the rumble strips. I have recently made a series of videos dealing with various McKnight Rd. related cyclist issues such as avoiding the highway off ramps in both directions just north of McKnight Rd.’s southern terminus at Evergreen Rd. I’ll post these in a new thread. On Murray Ave just north of Forward Ave, in Squirrel Hill. This one is probably more of a danger to pedestrians than to cyclists. Ten years in, I’m still finding them! Sat for 10 minutes on a railing on Penn at 23rd, counted three bikes going the wrong direction, one on the sidewalk. This would be a major hazard.